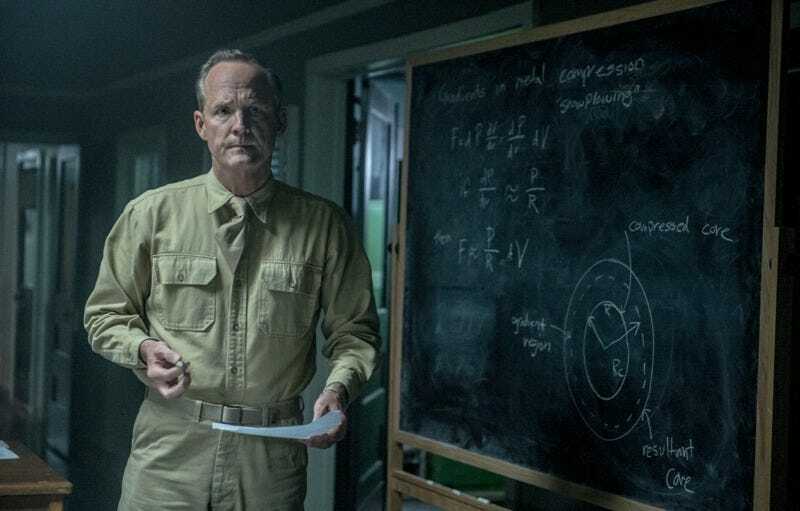 On the latest episode of Manhattan, the physicists assigned to developing the gun model design for the atomic bomb hit a major obstacle that threatens to sink the gun model for good. It’s a dilemma ripped straight from the history books, along with the eventual solution. There were two different bomb designs developed as part of the Manhattan Project: the implosion model (dubbed “Fat Man”) and the gun model (“Little Boy”). The first relies on plutonium for its nuclear chain reaction; the latter used a rare uranium isotope, U-235. And therein lay the difficulty. None of the proposed methods for uranium enrichment—i.e., separating out the precious (fissionable) U-235 out of raw uranium ore—was feasible. This was a serious technical issue that really did almost sink the gun model for good. General Leslie Groves (head of the Manhattan Project) always had two of everything; he was a belt-and-suspenders kind of guy. The Army was developing two methods for isotope separation, according to the series’ technical consultant, UCLA physicist David Saltzberg, who kindly answered a few of my questions about the science. One was electromagnetic separation, and the other was gaseous diffusion. The electromagnetic method, pioneered by Alfred Nier of the University of Minnesota, used a mass spectrometer, or spectrograph, to send a stream of charged particles through a strong magnetic field. Atoms of the lighter isotope (U-235) would be deflected more by the magnetic field than those of the heavier isotope (U-238), resulting in two streams that could then be collected by different receivers. But the process was costly and time-consuming, at least in 1940. It would have taken some 27,000 years to get a single gram of U-235 this way. They needed a lot more than that to power Little Boy. Gaseous diffusion’s principle was simple: molecules of a lighter isotope would pass through a porous barrier more readily than those of a heavier isotope. The tiny weight difference between U-235 and U-238 meant that initial separation would be negligible. Repeat the process hundreds of times in sequential “cascades,” though, and the end product would be significantly enriched uranium. But gaseous diffusion didn’t scale up to the necessary industrial levels needed for the Manhattan Project. And time, obviously, was running short. It was a third separation method that ultimately rescued Little Boy: liquid thermal diffusion, developed by a scientist named Philip Abelson at the Philadelphia Naval Yard. Thanks to Army/Navy rivalry and the whole compartmentalization protocol, the scientists on the Hill didn’t hear about this new method until barely two months before the Trinity Test. Liquid thermal diffusion didn’t yield particularly pure U-235 — it could only increase the 0.7% purity of normal uranium up to 1.4% in one pass — but it was a champ at processing megatons of raw uranium ore. And it turned out that being able to double the purity with each pass was enormously beneficial, because it also significantly reduced the amount of remaining material for further processing. If you start with 1000 pounds of natural uranium product, it contains only 7 pounds of U-235 within it. If you enrich it to 1.4%, then you only have 500 pounds to work with, or half as much to process. Enrich it to 23%, then you only have 30 pounds to deal with in the next stage, which is much more manageable still. When you get to 84%, it is 8.3 pounds, of which 7 pounds is U-235. As fictional physicist Paul Crosley (Harry Lloyd) says in the episode, the critical insight — often attributed to Groves — was to stop thinking of the various methods as competing with each other, and consider them as complementary, exploiting their respective strengths. In the end, they used liquid thermal diffusion to process the massive tons of raw uranium ore at the so-called S-50 plant. Then they used EM separation and gaseous diffusion to get the final ultra-pure, bomb-grade U-235 used in Little Boy. Top image: John Benjamin Hickey plays Frank Winter on WGN America’s Manhattan. Bottom image: Little Boy in the bomb pit on Tinian island. Public domain.